Earlier this week, Philadelphians were treated to an April Fools' Day prank courtesy of Mayor Michael Nutter and the city's Office of Transportation and Utilities. Across the street from city hall, an "E-Lane" was designated for pedestrians who use (and are distracted by) their electronic devices while walking. 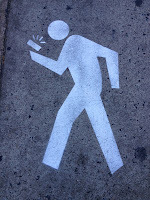 While the city only expects to keep the joke "E-Lane" around for a week, they also hope that it starts a dialogue about pedestrian safety and people looking out for themselves while walking around the city. Since this April Fools' week also happens to coincide with National Public Health Week (a time dedicated to recognizing the contributions and challenges of public health), I thought it was a great story for Pop Health. So I took a stroll down the "E-Lane" on Monday to take these pictures and to get the dialogue started. While I have written about (and am a huge supporter of) the vast and ever expanding benefits of mobile devices for public health, I also acknowledge the challenges that they have created. 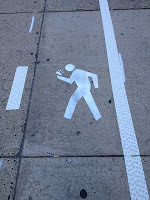 Even though Philadelphia created the "E-Lane" as a joke, drivers and pedestrians distracted by electronic devices have become a serious issue. The Centers for Disease Control and Prevention website on distracted driving tells us that each day, more than 15 people are killed and more than 1,200 people are injured in crashes that were reported to involve a distracted driver. Distracted driving occurs while doing another activity that takes your attention away from driving; these activities can increase the chance of a motor vehicle crash. While distracted driving can include talking on a cell phone, texting, or eating, texting is most dangerous because it takes your eyes off the road (visual), hands off the wheel (manual), and takes your mind off driving (cognitive). Research: papers on distracted drivers and pedestrians are being published in the peer reviewed literature. Education: cautionary tales of distracted driving are emerging in the popular media. Just in the past few months, the Today Show has hosted several sets of parents who lost children due to texting and driving. Celebrity Spokespeople: Teen sensation Justin Bieber is partnering with the Remember Alex Brown Foundation and Phone Guard's Drive Safe.ly application to promote responsible texting. The application reads text (SMS) messages and emails aloud in real time and automatically responds without drivers touching the mobile phone. Policy Change: Just a few weeks ago, Pennsylvania became the 35th state to enact an anti-texting law. The new law allows police to charge anyone caught text messaging while operating a vehicle with a primary offense and a $50 fine. As with most public health problems, we will need a combination of these strategies (i.e., individual education, social norm changes, policy/law changes, technological solutions, etc) to see a reduction in injuries and deaths. How can we balance the benefits and challenges of mobile technology for public health? Do you think the "E-Lane" in Philadelphia is an effective strategy for initiating dialogue around distracted drivers and pedestrians? In addition to the strategies listed above, what can public health and the public do to reduce injuries and deaths from distracted drivers and pedestrians?